Yesterday we went with my niece Jessica for a day trip to the beautiful city of Siena in Tuscany. It was raining heavily when we arrived but we bought umbrellas and didn’t let the weather put us off our sightseeing trip. I parked at the San Francesco car park, from where a series of escalators bring you up right next to the church of San Francesco. From here it is a quick walk right into the centre of town. Our time was limited and I had a few things that I planned to pack in to our day out. For a first time visitor I thought that a visit to the Duomo and the Museo Civico were the most important things to see, along with a stroll around the Campo, Siena’s scallop-shell shaped central piazza. A joint ticket costing €12 gives you access to the Duomo, the attached Piccolomini library with Pinturicchio’s frescoes depicting the life of Pope Pius II, the Baptistry, the crypt below the Duomo and the Museo dell’Opera del Duomo (which has most of the panels from Duccio’s altarpiece originally in the Duomo and great views from the top of the unfinished Cathedral extension). 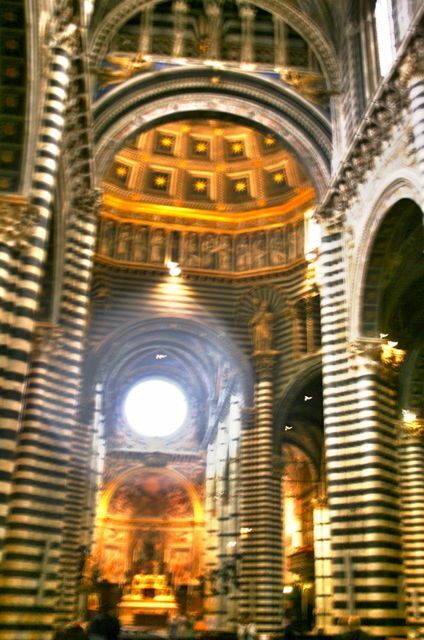 We started with the museum and, having admired the panels of Duccio’s medieval masterpiece, made our way up the slightly claustrophobic spiral staircase to the top of the wall that would have been the front of the enormous Duomo extension (had the Black Death not killed the majority of the population of Siena in 1348). 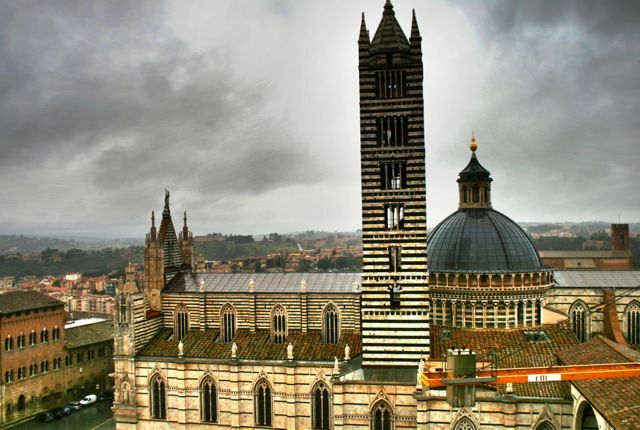 This is a great vantage point, and, although not as high as the Torre del Mangia that towers above the Campo, it offers a bird’s eye view of the city without having to queue. From here we headed into into the Duomo with its impressive green and white striped marble columns and spacious interior. You can look down as well as up here, the floors have intricate designs in inlaid marble. A doorway on the left of the Duomo leads into the the Piccolomini Library, frescoed by Umbrian painter Pinturicchio who was possibly helped by Raphael. The frescoes show scenes from the life of a great Renaissance pope (and local boy made good), Pius II. 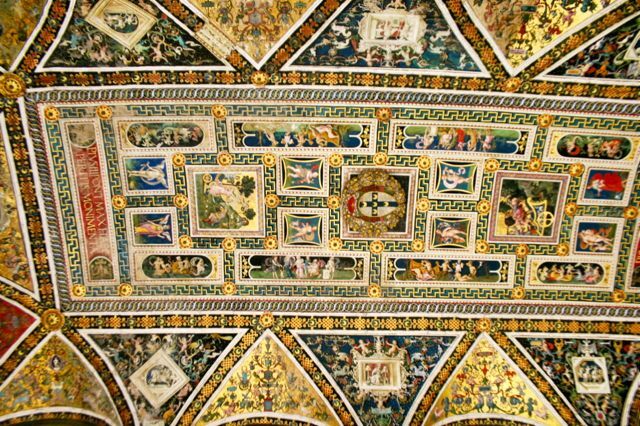 Once we had finished in the Duomo, we used our tickets to visit the Baptistry and the Crypt, then we walked back to the Campo and bought tickets for the Museo Civico, situated in the Palazzo Publicco (€8 full price, €5.50 reduction). There were four paintings that I wanted to show my niece here, Simone Martini’s Maestà, his equine portrait of Guidoriccio da Fogliano and Ambrogio Lorenzetti’s frescoes of Good and Bad Government. 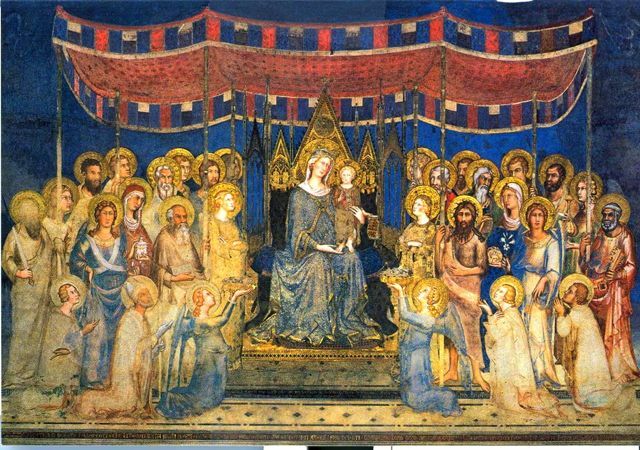 Although the Maestà is a common theme in medieval art, Simone Martini’s version had a new feature; he painted a canopy over the throne to give the painting more depth. Whether the portrait of Guidoriccio da Fogliano is actually by Simone Martini is the subject of fierce debate in the art world, however, whoever it is by, it is a beautiful painting. 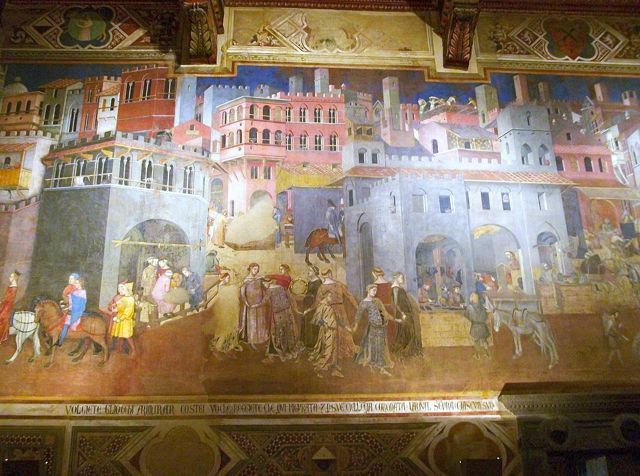 In the next room Ambrogio Lorenzetti painted his Allegory of Good and Bad Government to remind Siena’s ruling council of the effects that their decisions could have. A few years later the city was thrown into chaos as the Black Death swept through Siena’s narrow streets, killing Ambrogio Lorenzetti and his brother Pietro along with over half the population. The scenes from the Bad Government fresco must have seemed all too real to the survivors.